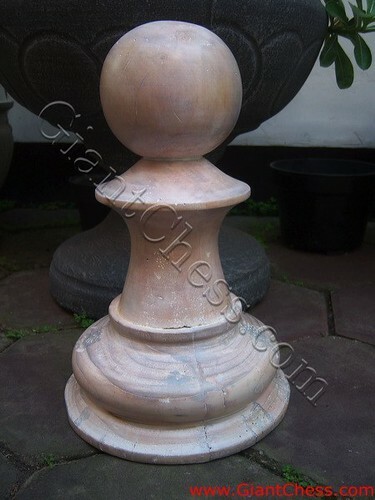 Chess piece is a part of chess equipment. Generally, chess game use two set of chess pieces in different color. A set of chess pieces is consist of 16 pieces. The 16 pieces has different role and moving. The 8 pieces called pawn. They stand in front of the row. Those pawns has same design and shape. While, the 8 pieces commonly called as core soldier in chess game. But, each of core soldier has different design and shape. As the picture, this time we give you an example of pawn piece. One of soldier in chess game that stand front and move first. He duty to protect the King chess with the others chess soldier. To make it different, we polish the pawn in unusual look to get the antique touch. It has carved by expert craftsman and polished perfectly in beautiful looks.